The LONG week-end is over. There is still time to shed a few pounds before the summer season kicks off for real on July 4th. Try some of these swaps courtesy of Hungry Girl. 1. 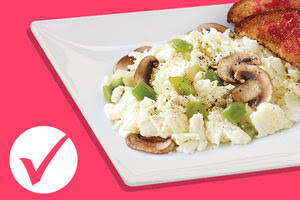 Go egg-whites only for your morning scramble or omelette. A 3/4-cup serving of liquid egg whites (the equivalent of 3 eggs) is about 100 calories, and 3 whole large eggs are about 215 calories. I like the nutrients from the yolk so I only keep 1 yolk if I am having more than 1 eff. 2. Opt for English muffins over bagels. The average whole-wheat English muffin has around 130 calories; a wheat bagel has closer to 300. 3. Three words: Powdered. Peanut. Butter. I LOVE Peanut butter. I mean who doesn’t right but who wants all of the calories (or points), right? PB2 is good and can take the place of PB for less than half the calories. Want it to be a little creamier? Add a few extra drops of water. 4. Trade doughy rolls for flat sandwich buns. These come in lots of flavors including bagels. These slim 100-calorie versions are really good. 5. Making tuna or chicken salad, use fat-free plain Greek yogurt in place of regular mayo. For every 2 tbsp., you’ll slash over 150 calories! I am a Miracle Whip Light kind of girl since I can’t have dairy and slash the calories as well. 6. Exchange rice for cauliflower rice. I will admit, I love this swap BUT I do buy the frozen or bits since I never got it right with my blender. Mash it up with your potatoes to cut the calories too. 7. Use nonstick spray on your skillet instead of oil. The spray is practically calorie-free, while a 1-tbsp. “glug” of oil runs about 120 calories. 8. Combine finely chopped brown mushrooms with ground beef to cut calories! Replace 4 oz. raw extra-lean ground beef with 2 cups of the mushrooms to save around 100 calories — just think if you were swapping out the fattier stuff! I need to try this. 9. Spaghetti squash! Zucchini noodles! Veggie noodles are a great calorie saver — ditch conventional carby pasta, and you’ll save around 160 calories per cup. 10. Eat an orange (or clementines) instead drinking orange juice. OJ has around 112 calories per cup, while a medium orange has just over 60 cals, plus filling fiber. 11. Switch from sugary sodas to zero-calorie carbonated water or seltzer. Or eliminate carbonated beverages totally. Save about 120 calories per can! 12. Got dip? Use veggies instead of chips to scoop it up. An ounce (about 9 chips) of tortilla chips has around 140 calories and will be gone in no time. Eat an entire large red bell pepper or about 14 baby carrots instead for around 50 calories. 13. Choose popcorn over chips — you get more volume! A single-serving baggie of Lay’s Classic has 160 calories. You can have 5 whole cups of 94% fat-free popcorn for 100 calories or less. 14. Having a chocolate craving? Why not have a fudge-flavored Enlightened The-Good-for-You Ice Cream Bar for 70 calories (plus 8g protein!). 15. Want something refreshing and sweet? Give fruity ice cream the cold shoulder. A measly 1/2 cup of strawberry ice cream has around 130 calories; have an entire cup of frozen berries for half the calories. 16. Halve the cheese. Cheese is great, but we’re generally served way more than we need. At a restaurant, ask for half of the usual amount to save calories without sacrificing flavor. 18. When at the sandwich shop, opt for mustard over mayo. A tablespoon of full-fat mayo has around 100 calories, while standard yellow mustard has closer to 5. Yes, 5! 19. Trade dressing for salsa. Salad dressing can add hundreds of fatty calories to a healthy meal; 10 – 20 calories’ worth of salsa is a total bargain in comparison! 20. Choose broth-based soups over creamy ones. Fun fact: Yeah, you’ll save calories by selecting a lighter soup option — around 100 vs. 200 — but studies have shown starting a meal with a brothy soup leads people to take in fewer calories overall! 21. Lettuce buns. It’s gotten pretty trendy for restaurants to offer lettuce in place of traditional sandwich and burger buns; this is a stellar way to easily ditch around 200 – 300 calories. Don’t want to be extreme? Take off the top, and eat the sandwich open faced. 22. Skip whole-milk morning lattes and sugary cappuccinos; grab a coffee with skim milk instead. We’ve been known to carry packets of our favorite natural no-calorie sweetener around for this very purpose. What are your best tips for cutting calories? Share them with us.